Click on the Play Button and 'Undead Highway' will start after this message... Thanks for waiting! You have a huge arsenal to fight a zombie plague. Choose the one that auits you best and defeat them! Watch your back to avoid being caught by surprise. More weapons and fun available! It's time to use your bazooka again and get rid of the zombies. Manage to get the three stars in each level. Enjoy this new version! In this game similar to Metal Slug you'll be surrounded by zombies. Defeat them and spend on new and more powerful weapons. Enjoy this sequel! Knives, a bow and lots of arrows should be your companions in this fight against waves of zombies. Put your accuracy to test and hit the target! The world has been infected with a deadly virus, and everyone is turning into a zombie. However, there's a saviour who will get rid of this plague once and for all it's you! Protect your bunker, upgrade your weapons and above all kill every zombie! 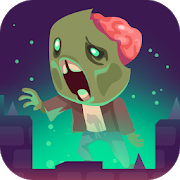 Try to survive in a world taken by zombies! Travel around looking for useful items, food and gas. But beware, they're everywhere! Use all kinds of weapons to get rid of them and try to survive until you find shelter in this wild world! The world is being taken over by bloodthirsty zombies. Be brave, hide behind the barricades and face them. Press 1-6 to select a weapon. New levels available! Shoot at zombies with your cannon and impale them on spikes, hooks and chainsaws to turn the switches off. Enjoy this third installment! Launch zombies using your cannon and impale them in spikes, hooks, saws and all kinds of devices in order to turn the switches off. In this new expansion you'll be able to use a Metch robot to fight huge waves of zombies. Can you think of a better way of kicking undead asses? Zombies have taken over the city, but a group of survivors found a shelter on Haven Island. Try to reach the island in your car and defeat as many zombies as you can with the weapons you find.